A study of the University of Applied Sciences in Vienna has come to the conclusion that more and more companies want to outsource their project management or parts of it to specialized project service providers. The study focused on the potential benefits of outsourcing project management and which type of activities can be hived successfully. The study sample consisted of 165 project managers, program managers, project controllers and project team members from Germany, Austria and Switzerland. 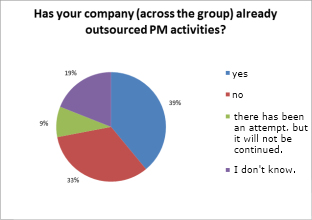 39 percent of the respondents said that they had already outsourced PM activities; on the other hand 33 percent have never done that before. 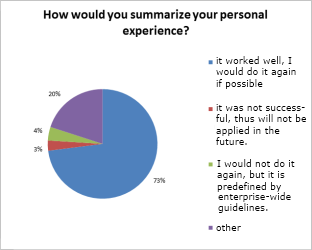 Nearly one half of the group stated that they are thinking about the possibility to outsource their project management or have already taken the first steps. In 38 percent of the cases, however, an outsourcing has never been taken into account. 13 percent of the interviewees said that they have already thought about outsourcing, but have not moved ahead yet. The participants were also asked about the reasons and benefits of outsourcing. 90 percent of the respondents found the concentration on the essential processes within the company after having discontinued of project management beneficial. Another perceived advantage of outsourcing was the access to external know-how. Also, outsourcing leads to an optimal resource utilization, which the respondents considered to be a good reason for the outsourcing of project management activities. Please click here to see the entire study (only available in German). Trend: Project Management Outsourcing - InLoox • Copyright 1999-2019 © InLoox, Inc. All rights reserved.